NOTE: IN 2016 the 10-mile race was swapped in favour of a half marathon. Ten miles is a great stepping stone distance between 10k and the half marathon and it also provides a perfect fitness test for those targeting an upcoming marathon but don't want to deaden their legs with a half marathon. So we're delighted to be able to welcome this new 10-mile race to the London running calendar. We caught up with race director Peter Wedderburn to discover all the whys, whens, and hows of this new race. So what was your inspiration for setting up the RBK10? We have been speaking to Kingston First and Kingston Council over the last couple of years in connection with other races we organise which come through Kingston. Initially I approached them about a Half Marathon, but during the planning we realised we could get in a great 10 mile course. With news of the cancellation of the long established local autumn race, the Cabbage Patch 10, we saw a great opportunity to launch the RBK 10 as a cracking alternative. Why 10 miles? What in your mind makes this distance special? Before the boom in marathon and half marathon running in the 1980s, 10 miles was the classic race distance and it is still a favourite with many club runners. Its long enough to become really involved, but an easier event to step up to from a 10k, rather than going for the half marathon. Top club runners will finish in under an hour, and most of the field will be home in under two. The finish line gets really busy between 75 and 90 minutes. Speaking of the finish line (which is in the Kingston Market Place), what can us runners look forward to at the end of the 10 miles? Water, fruit, great finishers' medals! The market is great these days and coffee and food will be available. Tell us about some of your favourite highlights on the course. 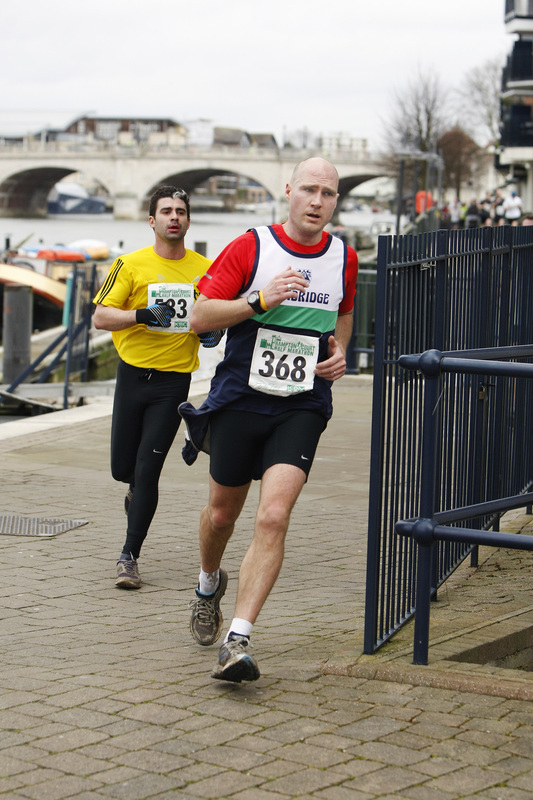 Kingston is situated on the Thames and we have great local runs by the river. The start and finish in Kingston are pretty special. On the course the early run through Canbury Gardens, the just-under-3-miles Barge Walk from Kingston Bridge to Hampton Court, and the half a mile Queens Promenade section are all stand outs. Are there any little surprise hills or off road sections we should prepare for? Probably not! The course is flat as a pancake and should produce good times. Apart from the start though it is on open roads and there are a couple of side road crossings, although you can expect good marshalling to greet you at these points. How would you recommend people get to the race start (assuming coming from central London)? By train to Kingston from Waterloo is the obvious route. It's less than five minutes to the start from Kingston Station. Also plenty of local car parks and no traffic problems with an early start. There are a lot of cycle racks in the central Kingston area so biking in is another good option. Any other inside tips or racing advice you can give us? Line up sensibly at the start according to how you think you will do. If you are quick, get to the front. If you think you can run 8 minute miles then you are probably first half. Slower runners towards the rear of the start pen. You will have a much more comfortable race if you are not being jostled or blocked. Are walkers welcome? And is there a cut off time? It is a running race and so not really aimed at walkers. Although of course we know some of the competitors will spend part of the distance walking. We do have a cut of time of 2 hours 30 min, which works out at 15 minute miling (fast walk/marching pace). This will be plenty for most runners. In our recent Harry Hawkes 10 Mile the last runner finished in 2hrs 12 minutes. 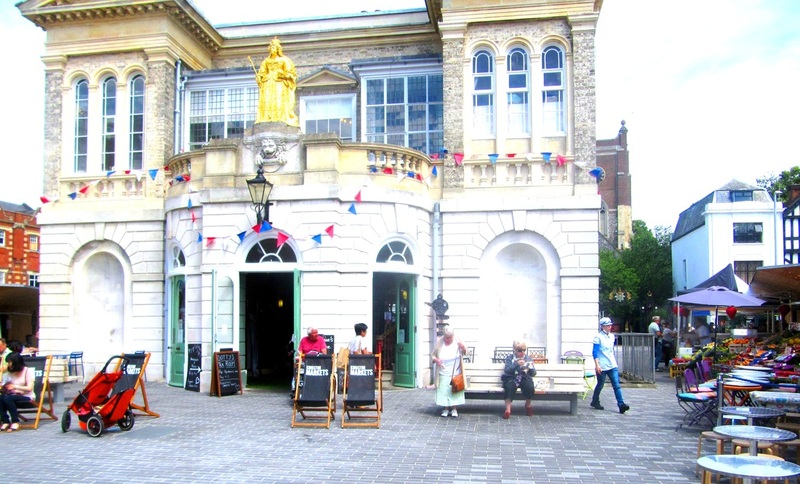 Market House in Kingston is the setting for the start/finish area for the Royal Borough of Kingston 10 Mile.